The AudioQuest SLiP XTRM line of cables feature CL3/FT4 rated jackets for use within walls during home theater and whole-house audio installations. The AudioQuest SLiP XTRM cable line includes the SLiP XTRM 14/2 cable (pictured here) and the SLiP XTRM 14/4 cable products. Introduced recently, the new AudioQuest SLiP XTRM Cables are designed to provide integrators with a choice of cabling products to meet their architectural installation needs. AudioQuest says that its latest in-wall speaker cable products were developed to meet integrators' request for higher performing in-wall cables that are also easy to pull. The SLiP XTRM line of installation cables retain the company's slippery easy-to-pull CL3/FT4 rated jackets, which feature feet and meter markers that countdown from the outside-in to allow integrators to tell how much cable is left on a spool. The SLiP XTRM line of cables utilize a more advanced form of AudioQuest's Semi-Solid Concentric design it calls True Concentric, which use fewer, larger strands that do not change position down the length of the cable. Its True-Concentric technology takes the design of the Semi-Solid Concentric concept further by having each layer of strands spiraling in the opposite direction from the one underneath. The electrical contact strand interaction of this design is reduced because there is more pressure on the points of contact, rather than lines of contact. The SLiP XTRM line also uses low-distortion, Long-Grain Copper (LGC). 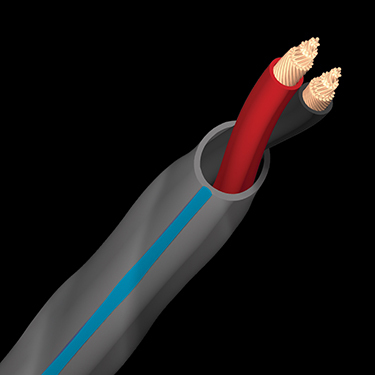 The central area of the SLiP XTRM conductors use the LGC material and from there the cable design transitions to Perfect-Surface Copper (PSC) with a smooth surface. AudioQuest says the PSC's smooth surface has a great effect on the cables' clarity, and "careful application of PSC and LGC enables performance closer to using only the more expensive PSC, while gaining the economic advantage of the superb LGC." AudioQuest boasts, "the net result is simply the highest performing, easiest-to-install CL3/FT4 certified line of speaker cables in the business."